Stars of sport, music and TV watched on as the Washington Wizards came from 16 points down to beat the New York Knicks 101-100 in the NBA in London. The Wizards trailed 100-99 with less than one second remaining when Thomas Bryant’s lay-up was stopped illegally by Allonzo Trier and called for goaltending. The two-point penalty put the Wizards ahead, although the decision was only upheld after a lengthy review at the O2 Arena. The Knicks had four tenths of a second to find a winner, but Emmanuel Mudiay’s shot came up short. The Knicks were without centre Enes Kanter, who did not travel to Europe after Turkish prosecutors issued an international warrant for his arrest. Kanter, 26, a critic of Turkish President Recep Tayyip Erdogan, has been accused of having links with armed groups said to be behind the country’s 2016 failed coup. He told the BBC he is “trapped” in the US and watched the game on TV in New York. 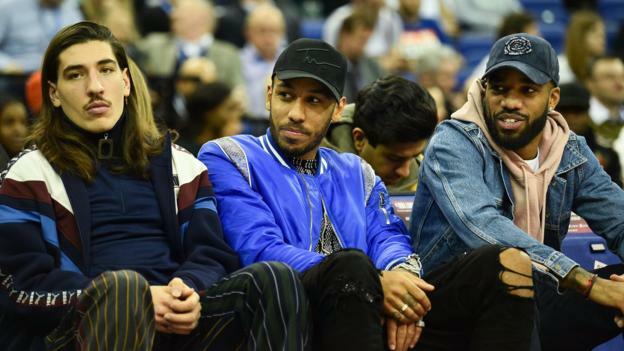 Arsenal footballers including Hector Bellerin, Pierre-Emerick Aubameyang and Alexandre Lacazette were in the crowd alongside Chelsea’s Ruben Loftus-Cheek, Olivier Giroud and Marcos Alonso, Liverpool’s Joe Gomez and many other Premier League players. Former England midfielder Jamie Redknapp, comedian Michael McIntyre, rapper Tinie Tempah, band Rak-Su, model Lara Stone and magician Dynamo were also in attendance. It was the ninth regular season game to be played in the UK capital. NBA commissioner Adam Silver said before the match that the league is considering playing a game in Paris next year.